Are Jehovah’s Witnesses preaching a false message? Home/Mailbag/Are Jehovah’s Witnesses preaching a false message? ← Will the people of Sodom be resurrected? Apologies: For some unknown reason messages sent to me from the contact form were either not being delivered or were sent to my spam folder. This question from a JW reader was recovered. 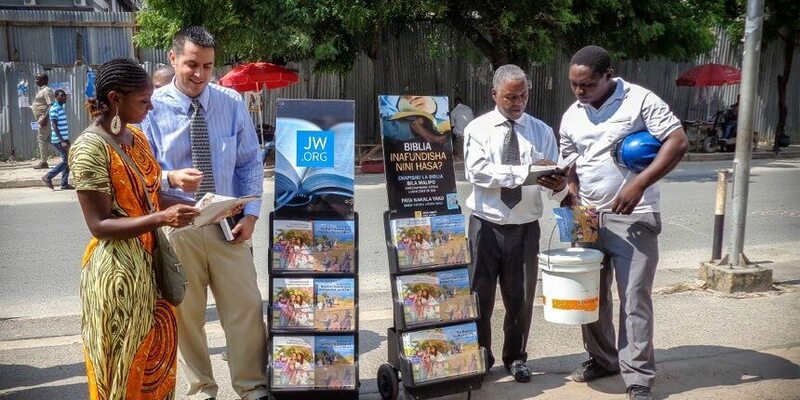 QUESTION: You say in some of your videos that despite some flaws, Jehovah’s Witnesses are doing God’s will on earth, namely preaching the Kingdom message. You also say (and I wholeheartedly agree) that 1914 is a false teaching; hence, Jehovah’s Witnesses are promoting a false parousia. My question is this: If Jehovah’s Witnesses are promoting the Kingdom, but teaching that it was established over 100 years ago, how can they possibly be fulfilling the prophecies? If a person was learning the Bible from JWs and rejected their eschatology would they be rejecting the Kingdom message? To me it seems a false kingdom message cannot possibly fulfill the verses in Mathew 24 and Luke 21. I have my theories but I would like to hear yours. First, I do not have any theories. I just deal with the Scriptures. And the situation with Jehovah’s Witnesses today is not without precedent in the biblical record. Consider the fact that shortly after Jesus began his ministry he also commissioned his chosen apostles to begin a preaching campaign in advance of him. Not only that, shortly after sending the apostles out he also sent out seventy other disciples in pairs. Like the Watchtower with the ministry of Jehovah’s Witnesses, Jesus gave his disciples a specific message to declare. They were to announce to their fellow Israelites that the Kingdom of the heavens had drawn near. Amazingly, however, although Jesus entrusted them to be his publicity agents not one of those original preachers had any idea what the Kingdom of the heavens even was. Even at the very end of Jesus’ ministry the apostles still had no inkling that Jesus was going back to heaven. No doubt they were laboring under the same delusion as were all of the Jews, imagining that the restoration of the throne of David was going to be an earthly set up. That is evident from what is stated in the 19th chapter of Luke, which states that upon Jesus’ approach to Jerusalem the disciples imagined that the Kingdom of God was going to display itself instantly. Even after he was resurrected the disciples asked Jesus if he was restoring the Kingdom to Israel at that time. The fact that the disciples had false expectations regarding the Kingdom was a stumbling block for them. When Jesus was taken from the earth without having restored the Kingdom those who had been his followers had to adjust their thinking. They had to resolve the dilemma if they wanted to continue on in Jesus’ teachings in his absence. They had to demonstrate that they had faith and were not simply following a man who performed impressive miracles. So, even though the original followers of Christ did not have any idea what the Kingdom was, their message —the Kingdom of the heavens has drawn near —was still relevant for the reason that those who responded to the message and who followed through after Jesus left the earth were ultimately welcomed into the Kingdom of Christ by virtue of being anointed by the holy spirit. Jehovah’s Witnesses are in the same position as the original disciples before Christ was killed; albeit, we know considerably more about the Kingdom of God then did the 70 whom Jesus first commissioned as Kingdom proclaimers. (Who is Blind?) Just as the reality of Christ’s death had actually been hidden from the apostles (Luke 9:45), and even the great teacher was unable to disabuse them of their false notions, the same operation is at work now —blinding the modern Kingdom proclaimers to the reality of a future parousia of Christ and all that that entails. To be sure, the 1914 doctrine stands as a huge stumbling block, not just to those relatively few persons who see the fallacy of it now, but to virtually all of Jehovah’s Witnesses going forward. Just as the unexpected death of their rabbi and master forced the apostles to rethink their faith, the sudden outbreak of wars, famines, pestilence —in short all the things Jesus foretold would occur as a prelude to his ultimate presence —will impose a severe test of faith upon everyone associated with the Watchtower. Just as the original preaching of the Kingdom prepared persons to enter into the Kingdom when the door was opened on Pentecost, the Watchtower has unknowingly prepared a people for the final harvest. The falsity of the invisible parousia doctrine merely serves as a veil that will be lifted at the unveiling and revealing of Christ. In that respect, the Watchtower is doing God’s will, even in promoting a false parousia, since it is only by God’s permission that Satan is allowed to exert a deluding influence over Christ’s congregation prior to his coming. As Jesus illustrated, prior to the conclusion there are lawless persons and stumbling blocks within Christ’s Kingdom —that is to say, within his congregation —his organization if you prefer. So, the Scriptures acknowledge that there are stumbling blocks in Christ’s Kingdom that have the potential to wreck a believer’s faith. That is what a stumbling block is. Nevertheless, we can be confident that Jesus will fully accomplish his Father’s work in spite of those negative factors, just as he did when he sent out the 70 to declare the exciting, world-changing message, that the Kingdom of the heavens had drawn near.